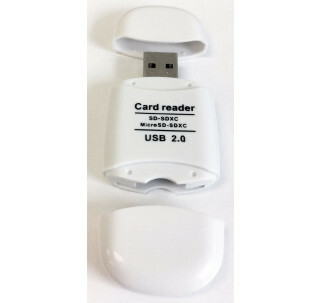 The Dual Slot USB Reader is a fast and easy way of transferring memory files between different types memory cards and PCs quickly without any trouble. It is the perfect partner for your digital camera, mobile phone, PDA, camcorder, or MP3 player. It is compatible with the latest SDXC technology and works with any USB port. It has an SD card port and a MicroSD port which appears as a removable drive. Compatible with the latest technology ÃÂ SDXC (SD eXtended Capacity). Works with Windows XP, Vista, 7, etc. USB 2.0 specification, will work in any USB port. SD Card port appears as a removable drive. Draws power from the USB port.